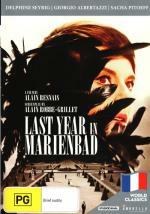 "This story is already over"
���� It is almost impossible to categorise Alain Resnais�s magnificent 1961 French New Wave film Last Year at Marienbad (L�annee derriere a Marienbad - the DVD cover puts the film�s title as Last Year in Marienbad but the IMDb has it as Last Year at Marienbad and the context of the film to my mind make that a better translation) although many critics over the last 50 years have dissected the film and tried to explain the symbolism and what it all means. On the surface, in an ornate, baroque hotel somewhere in Europe, a man (Giogio Albertazzi) tries to convince a woman (Delphine Seyrig), who is at the hotel with a man who may be her husband (Sacha Pitoeff), that the year before at the hotel they had an affair and that she had promised that, in one year, she would go away with him. The man has come in response to her promise but the woman says she has no memory of any affair or any promise. Underneath, the film is a lot more that this short outline suggests; with its Oscar nominated screenplay by Alain Robbe-Grillet, it is pure art house cinema with no narrative but instead an intermingling of images and sequences that may be the present, the past, a memory, a fantasy, a dream, or all together. The truth of what happened or may have happened, if anything is truth, is not disclosed. ���� Last Year at Marienbad is told via the voiceover narration of the man which sets the scene from the opening credits as his narration circles around on itself, repeating sentences with slight variations, as the camera slowly pans around the opulent corridors of the hotel, the mirrors, corniches, statues and paintings. In the sequences which follow the actors are almost static, posed like statues in tableaux with snatches of conversation as the narration continues. As the narrator speaks, remembering the past or talking to the woman about their past, as he believes it, scenes and narration circle and repeat with slight variations and sometimes the scene on screen does not quite match the man�s memories. Past and present intermingle, sometimes with similar sentences occurring in both timeframes. ���� This might make the film sound arty and boring, but in reality it is anything but. The black and white images are stunning, almost photographic in their depth and detail, courtesy of cinematographer Sacha Vierny, who later worked with that most visual of directors Peter Greenaway on a number of his films including The Cook, the Thief, His Wife & Her Lover (1989) and The Pillow Book (1996). In addition the film builds in intensity towards the climax, mesmerizingly turning back onto itself for, as we are told a couple of times right from the start, �this story is already over�. With emotions held, mostly, in check the three main actors Giogio Albertazzi, Delphine Seyrig and Sacha Pitoeff are superb in their stillness, glances and looks expressive of a thousand words of hidden meanings. ���� Alain Resnais, who also directed the wonderful Hiroshima Mon Amour (1959), won the Golden Lion with Last Year at Marienbad. His film has influenced filmmakers, and perplexed critics, ever since it was released in 1961. Fifty years on, the film still rates 95% from critics on rottentomatoes.com and 85% from the audience. This is a good reflection of the enduring quality of this magnificent film; it remains a film to savour, and a film to talk about. ���� Last Year at Marienbad is a black and white film presented in its original aspect ratio of 2.35:1, 16x9 enhanced, in the NTSC code. ���� Some films are made for black and white, and this is one of them. Filmed mostly in the Nymphenburg Palace in Munich, the interiors with their mirrors, corniches, statues, paintings and gilt are stunning, the formal grounds, gardens and water features no less so. Detail is strong when it wants to be, but this is also a film where variations in brightness and contrasts, as well as darkness, occur, placing the darkened hotel card room and lounges alongside the whiteness of some scenes in the woman�s rooms. Greyscales are good and blacks solid. There are no small marks; there is one large black circle at 19:29 that may be a reel change marker and a bit of motion blur against the ornate walls and mirrors. Film grain is present and pleasant. ���� English subtitles are provided in a cream text; there were occasional misplaced capital letters and an exclamation mark in the middle of a sentence but otherwise they were fine. They can be removed for those who understand French. ���� Audio is French Dolby Digital 2.0 mono at 320 Kbps. The film was released with mono audio at the theatre. ���� Dialogue, which is mostly the narrative voiceover, is clear. There are only a few effects used during the film including the wind, running water in the fountains and footsteps on the floors or gravel which have a decent depth. The score by Francis Seyrig is organ based, with only a couple of orchestral fanfares; it is somewhat disorienting, thus suiting the film. Hiss and crackle is not present. Obviously there is no surround or subwoofer use. ���� A film as influential as Last Year at Marienbad has had a number of DVD and Blu-ray releases with a range of extras � see the DVDBeaver comparison for example here. Our Region All NTSC release from Umbrella is bare bones. ���� To my discredit I had not seen Last Year at Marienbad before I requested the film to review. Classic films can sometimes be propped up by their reputation but this is not the case with Last Year at Marienbad; I was captivated by its imagery and the way it tells its story; a memorising and sensual examination of uncertainty, fantasy, memory, reality and truth. Simply magnificent; Hollywood this is not! ����The print is very good for a 55 year old film, the audio is the original mono. No extras. This film deserves better and fans most likely already have a copy from another region. But if you are a film fan, and do not have a copy of this influential film, at least we do now have a release in our region.